The long-awaited policy proposal from Alexandria Ocasio-Cortez and Ed Markey has finally surfaced—and it aims to turn U.S. agriculture into a positive force for climate change and social justice. Given the December passage of a new farm bill that largely maintains support for industrial agriculture, and the general political gridlock in Washington, it will be an uphill push to secure a Green New Deal that includes major food system reforms. Proponents won’t just face resistance from the meat and dairy industries; entrenched interests in every aspect of the food system are likely to oppose sweeping changes. However, Green New Deal proponents will face both the entrenched opposition in the Republican Party as well as obstacles within the Democratic Party. For instance, after Ocasio-Cortez pushed the issue to the forefront last December, Democratic leaders put a halt to her select committee idea, instead opting to revive a climate committee that lacked any legislative powers. Democrats on the House Agriculture Committee did not return requests for comment by press time, but Rep. Collin Peterson, the Democratic chair of the committee, has also been downplaying the importance of climate action in the House. Peterson expressed his skepticism recently to reporters, asking, “What is our goal? Planting all those trees? I’m actually cutting down the forest,” he said, referring to a recent logging project on his Minnesota farmland. Time and politics will tell how far the Green New Deal can go, as the long fight over food, land, and resources continues, and the climate survival clock keeps ticking. 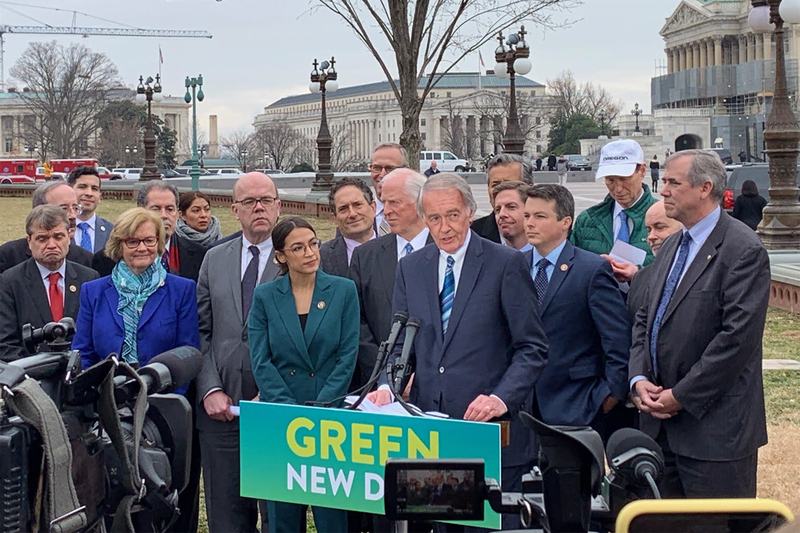 Top photo: Rep. Alexandra Ocasio-Cortez and Sen. Ed Markey during today’s introduction of the Green New Deal resolutions (photo courtesy of Rep. Chellie Pingree). What exactly will this mean for my plate? I don't see specifics here about how our food supply will change or what this will mean for consumers. It means your plate will often be empty. Our food supply will be unsustainable as current population numbers will strain a now compromised agricultural infrastructure. Pestilence, famine, disease and death will become common place. The concept of "consumers" will no longer exist as society will degenerate into a dark ages barbarism. I think this is a great plan. We are running out of time on this planet and changing our evil ways might slow it down or stop it. The only problem is that the Republicans and others will not agree. The problem with the GND is that it has no basis in reality. Reality is that using natural gas to make ammonia for fertilizer and oil to make pesticides gives us yields averaging 170 bushels of corn per acre. Without those, yields will quickly fall to about 14 bushels per acre. The GND is a suicide pact. "guaranteed minimum prices for farmers". Let me know and I can send my address so you can send me a check or checks. Massive outreach to and organizing of a base of the marginalized and powerless will be required, especially to & of a lumpen proletariat that does not know its opportunities, has given up and never votes. There isn't an alternative, however. Why? Because atmosphere - soil - plant cover, and the IS the foundational and limiting resource for all else. Prevailing sicknesses of carbon, and especially, water cycling are no longer to ignore. Just ask Houston, New Orleans and all of North Carolina and Vermont. I truly hope she intends to overhaul the Farm Bill. Thank you. My heart breaks for the millions of citizens who are suffering due to toxicity in our environment and in our food. The suffering of animals being raised in tortuous conditions and who present health risks to the consumer. Our farmlands are controlled by corporate interests to feed their pocket books not to feed the world. I appreciate your efforts, and we will continue to vote with our dollars. Our government subsidizes corporations. It is no longer concerned regards the health and well being of the American people. These people need to get out of NYC and see how the real world is and not imagined in their mind! They have no clue about farming or cattle raising! The authors carefully avoided mentioning the cost changes in the GND. As mentioned in earlier comments, production per acre will fall dramatically if synthetic fertilizer and pesticides are reduced. That means (surprise!) that many more acres that are now wild, would be pressed into service as cropland. Bye Bye trees. And by the way, since the cost of food will skyrocket, we'll need a lot more subsidies and food stamps. I'm all for re-examining public policy, such as mining and permits on public land, and research on how to reduce dependence on pesticides. But a panicky response to an iffy alleged threat is wholly unwarranted. As a second generation Organic farmer who actually makes a decent living farming I think that I’m qualified to comment on this matter. One reform is needed; not this spiderweb of ideas from someone who’s never farmed. Stop all farm subsidies within five years and let the chips fall where they may. The smart farmers will figure out what they need to do to attain viability. The others will die off (as they should). We need to end this system of financial unsustainability once and for all. The word 'sustainable' needs to be retired, especially in the agricultural (read: soil) context. As Gabe Brown says, "Why would we want to sustain a degraded resource?" The answer is that we wouldn't. Rather, we would want to *regenerate* it -- or bring life back to it and/or it back to life. And we can do that, 'countrywide' and eventually worldwide, using the best practices of regenerative agriculture. In so doing, many of the other laudable goals of the GND will be accomplished. Someone needs to bring AOC and the authors of the GND up to speed. Another foolish socialist trope. This crap is coming from Chinese spies that lurk in our universities corrupting our children's minds with socialist fantasies. Socialism has never worked. Capitalism is the force that has lifted billions out of poverty over the past 50 years. Even in China, the force that lifted the Conmmies out of poverty was capitalism. Socialism retreated after its failure virtually everywhere it has been tried. The green dream or whatever it's called is nothing more than the same old watermelon these foolish children have been peddling for generations - green on the outside, red on the inside. Don't be a fool, reject the GND on its face, and reject those peddling this tripe. So-called Industrial Agriculture has been a disaster for our food supply system, our environment, our public health and our economy. Existing "agricultural policy" is essentially government support for agra-business interests and antithetical to small farmers and sustainable, ecologically sound farming practices. It is long past time that we actually focus on this critically important issue, and address it in an effective way. The Green New Deal is a first step in the right direction. How about full subsidies for small organic farms for families to create a new and vibrant food economy as well?